Your look. Our Quality. No Compromise. Create exactly the furniture you want, be confident it’ll have the high quality you need, and have it in your home faster than you think. The HGTV Home Design Studio offers nearly unlimited options to create furniture that’s uniquely you. Choose your fabric or leather, your finish, your trim. Choose how deep you want a seat, what style you prefer a wood leg, and how firm you like a cushion. The end result? A custom piece that looks and feels exactly right. Custom UpholsterySettle in, get comfy, and enjoy the feel of creating the perfect place to perch. CU. 2Studio or apartment? Gotcha covered. Smaller sizes for smaller spaces. Upholstered BedsBegin each day by waking up in a beautiful, custom bed. Ottomans & BenchesFrom cocktail tables to extra seating, design one piece with many uses. PillowsCreate small flourishes that can refresh your entire room. Fabrics & LeathersMore than 800 fabrics to choose from in-store. 150+ online. Take a look. Need design inspiration? We’re happy to bring your vision to life. Tell our designers about your home: how you live, what styles you like, how large your room is. We’ll help you create the furniture that’ll make the most use of your space and bring your style to life. your design into a custom piece, ready for your home. Every piece is built by hand in North Carolina, ensuring your custom piece has the expert craftsmanship you expect from Bassett Furniture. Our frames are built with interlocking, laminated hardwoods. Our trim is placed by hand. We use a high-density foam that keeps cushions looking plusher, longer. 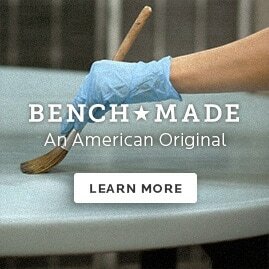 For more than a century, we’ve build furniture with a strict attention to detail and a respect for quality materials. From the coils you’ll never see to the trim we sew by hand, we ensure each element is worthy of your home.